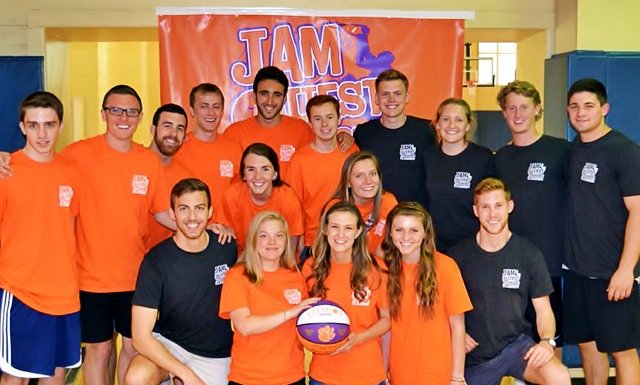 The first-ever Clemson JamQuest tournament of spring 2014 was one for the books! The Clemson JQ planning team made sure everyone on Clemson’s campus heard about this incredible opportunity to raise money for orphans in Kenya, through advertisements on computer monitors, posters throughout the campus and town, ads on all the dining hall tables, handing out flyers on our high-trafficked library bridge, and much more. The tournament was even brought to the attention of the entire Clemson football team and Coach Dabo, and numerous football players played at and came to support the event. JQ Clemson raised over $2000 and had over a dozen teams play in this epic three-on-three basketball tournament. All the pre-event work and the event itself did exactly what JamQuest Hoops is all about – raise crucial funds and awareness for children in need, raise up young leaders and raise the roof! Clemson is excited to have many more JQ tournaments in the near future!